yet I think it somehow fits the music. Where did the name come from? Putti, Evelyn Brent, Carmel Myers, etc. does this differ from, say, harsh noise, or power-electronics, in your perspective? How did you first find out about noise as an art form? and articulated in school further into the harsh noise technique that I was interested in doing. deconstruction and power through minimalism. textural manipulation, or set a stage for a violent mic’d source (live or otherwise). for financial or physical limitations? Why do you think you’re so interested in sharks? What draws you to them? No Fun Fest performance, to me she was a direct action/portrayal of his personal obsession(s). the tangible small group of women across the room wearing American Apparel stirrup stockings. The Rita at a lower volume? with different physical natures for the audience and artist due to the pure volume. different, or is its monolithic presence essentially the point? and movement in the sound. development for me, but if I had to pick one it would be Bodies Bear Traces of Carnal Violence. What can we expect from The Rita next? Any upcoming recordings or tours? 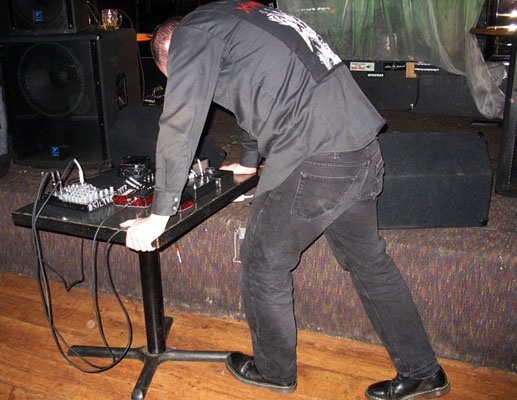 worked with Josh Rose (Sick Buildings / Rundownsun) in the power-electronics project Blouse.